Tabaco City, [09.28.17] – The local government unit of Tabaco City has launched today a one day activity in support to the awareness and prevention of the deadly viral disease on World Rabies Free. Tabaco City Vet at Work. Dr. Rene Rocha, administers castration the occasion of World Rabies Free.Photo by Rodel B. Balingbing. 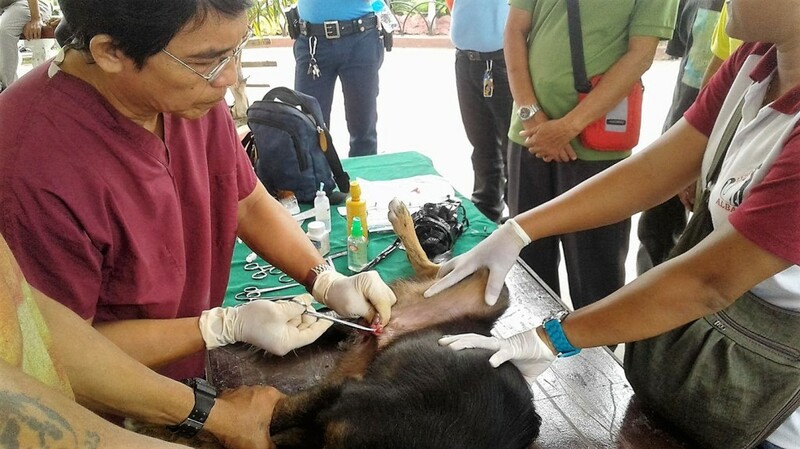 Dr. Rene Rocha said that the activity has successfully vaccinated 54 dogs and 1 cat, 12 dogs were castrated and was participated by residents of 19 barangays of Tabaco City. The activity was conducted at the City Plaza Kiosk in front of the City as a support of the local government of Tabaco City program on the eradication of rabies. September 28 is designated World Rabies Day and seeks to increase awareness that the widespread viral disease can be cured by a vaccine. Rabies occurrence are felt in more than 150 countries worldwide. The incubation period for rabies in one to three months. Initial symptoms include fever with pain and unexplained tingling, prickling or burning sensations at the wound site. As the virus spreads to the central nervous system, progressive and fatal inflammation of the brain and spinal cord develops. There are different kinds of rabies. With ‘furious’ rabies victims exhibiting signs of hyperactivity, excitable behaviour, a fear of water and sometimes of drafts of fresh air. Death occurs after a few days due to cardio-respiratory arrest. With ‘paralytic’ rabies, muscles become paralysed, starting at the site of the bite or scratch. A coma develops, and eventually, death occurs. The paralytic form of rabies is often misdiagnosed, contributing to the under-reporting of the disease. Current diagnostic tools are not suitable for detecting rabies infection before the onset of clinical disease. Unless the rabies-specific signs of fear of water or of air drafts are present, clinical diagnosis may be difficult. Dogs are the main source of human rabies deaths, contributing up to 99 percent of all rabies transmissions to humans. People are usually infected following a deep bite or scratch from an animal with rabies. Transmission can also occur when infectious material – usually saliva – comes into direct contact with human mucosa or fresh skin wounds. Rabies elimination is feasible through the vaccination of dogs and the prevention of dog bites. Human rabies vaccines exist for pre-exposure immunisation and are recommended for travellers to rabies-affected remote areas.